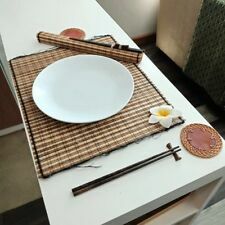 2 Set of Thai/Asian Bamboo Dining Table Placemats Set Chopsticks&Rest Coasters! Use for : Table Placemats, Table decorative. Material : Wood, Bamboo. Quantity : 1 pair = 2 sets. Color : Multi ( As picture ). P roduct of Thailand. Material : bamboo, silk. Condition: new. We believe that a good communication will be helpful for solving the problems. Material : bamboo, silk. Condition: new. Due to the difference between different monitors, the picture may not reflect the actual color of the item. We believe that a good communication will be helpful for solving the problems.